Entry strictly by exclusive invitation only and via guestlist only! Email us before 19 April (Thurs) to get into the guestlist. We'll revert with confirmation. OPEN TO PUBLIC AFTER 12 MIDNITE. NORMAL COVER CHARGE APPLIES. 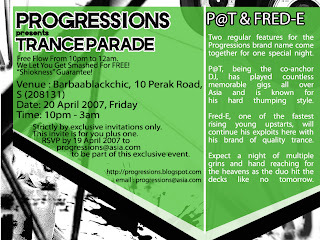 Two regular features for the Progressions brand name come together for one special night. P@t, being one-half of the co-anchor DJ for the brand night, has played countless gigs all over Asia and is known for his trademark thumping styles as well as his bag of surprises. Fred-E, one of the most prominent rising young upstarts will continue his exploits with his brand of quality trance.